A new zero-waste Cranleigh shop has opened in the village, with a mission to put the planet, people and provenance before profit. For Earth’s Sake opened in Cranleigh on Friday, offering a zero-waste, zero single-use plastics shopping experience. 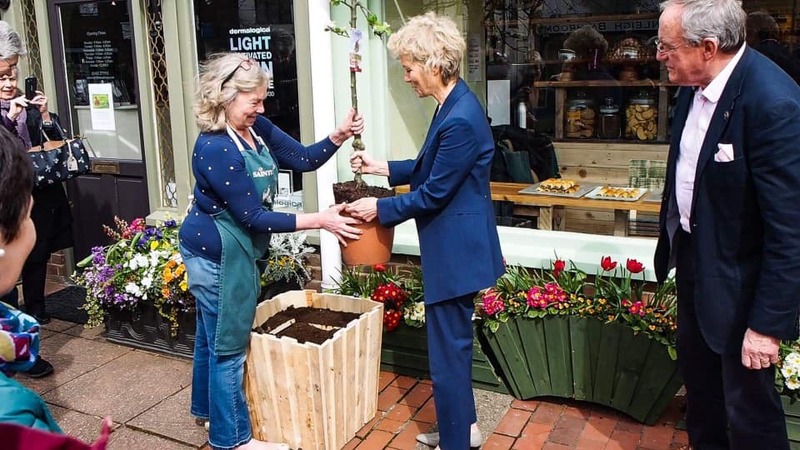 The grand opening was attended by actress Jenny Seagrove, who planted a tree outside to mark the special occasion. For Earth’s Sake stocks a range of local produce, dried goods, chilled foods, and everyday household items using the most environmentally-friendly methods possible. It’s the brainchild of Vanessa Ford-Robbins and Nik Huddy, with Nik’s nephew, Charlie Edwards, managing the shop on a day-to-day basis. Vanessa and Nik were previously stars of George Clarke’s Restoration Man TV series, in 2013 and 2015, following the restoration of their home at Longhurst Lodge on Horsham Road. The shop’s primary goal is to reduce, as far as practicable and possible, the unnecessary waste that enters our environment through human consumption. Our short-term aim is to foster a communal interest in zero-waste shopping and become a hub in Cranleigh for people, young and old, to shop ethically. We believe our customers to be like-minded individuals who are enthusiastic about protecting the planet and its animals. We want to involve younger generations and build a planet together that we can all be proud of, and we will aim to educate future generations about the numerous benefits of zero-waste shopping.